According to The Hollywood Reporter, the 67-year-old KISS bassist filed the request on June 9 over ownership of the gesture for "entertainment, namely, live performances by a musical artist; personal appearances by a musical artist." A basic Wikipedia search reveals that hand gesture not only dates back to the 5th Century BC founder of Buddhism, but that it’s also American Sign Language for "I love you." 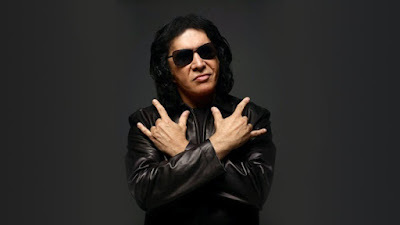 While there may be some question about the gesture’s first use in modern entertainment circles, at least two indications reveal it surfaced in the 1960s – prior to the formation of KISS in 1973. John Lennon used the gesture on the cover of The Beatles’ 1966 single, “Yellow Submarine”, and again – in cartoon form – above Paul McCartney's head on the cover of the 1969 soundtrack album for the animated film of the same name. A Chicago psychedelic band called Coven also used the gesture on the back cover of their 1969 album, “Witchcraft Destroys Minds & Reaps Souls”, and reportedly opened and closed their concerts with the horns as early as 1968. Ronnie James Dio is often cited as the source of mainstream rock’s affair with the devil’s horns, reportedly using it during Rainbow shows in the mid-1970s (and, later, with Black Sabbath and solo) while claiming his Italian grandmother used it to ward off the evil eye – which is known in Southern Italy as malocchio. Simmons’ trademark request will be reviewed by an examiner, who may consider the historical implications and use by others prior to the KISS bassist’s 1974 claim and, simply, whether the hand gesture may be so commonplace and too generic to be associated with a single rights owner. Read the details of Simmons’ trademark filing with the U.S. Patent and Trademark Office here.